Here are five series that I’ve found help me break the ice. I’ve tested some of these on my wife who’s an avowed “not an anime fan,” and she actually enjoyed them. I hope the list works as well for you! The subtlety of movement defines character as much as dialogue in Sound Euphonium. Capture from Crunchyoll’s stream for episode 13. Sound Euphonium (a.k.a. Hibike! 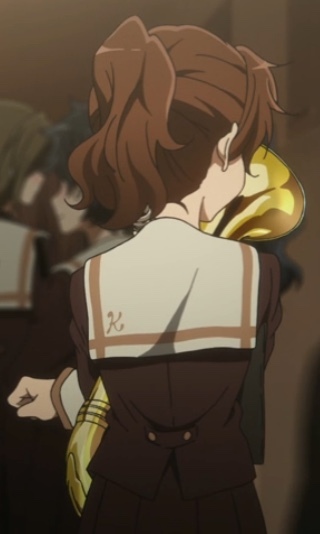 Euphonium) stars Kumiko Oumae, who wants to play in the band. She makes friends with Hazuki Katou and Sapphire Kawashima, and they encourage each other as they try out for band and hone their skills. In middle school, Oumae had played in band with Reina Kousaka, who took her instrument and competitions very, very seriously. The opening scenes present a flashback to middle school when they didn’t win a competition. Kousaka felt devastated and Oumae didn’t understand the feeling. Having always been naturally talented, Oumae didn’t understand how it felt to dedicate yourself to something and then not meet your own lofty goals. Over the course of the series, she faces that issue with dramatically satisfying results. There’s a drawback to recommending Sound Euphonium as an introductory anime series: it could set unrealistically high expectations. Kyoto Animation, the studio who produced it, is known for the quality of its work. The Anime News Network recently wrote a great article about them. They produce anime with depth of character, realistic situations, interesting pacing, and strong dramatic conflict. They go beyond well beyond those “basics,” though. The animation transcends lush and beautiful to become an engrossing character in its own right. The subtlety of character movements is as much an expression of their personality as the dialogue. As a parent whose daughter used to be in band (albeit in the United States), I found so many of the details to be authentic. The band tuning up, the nervousness before a concert, the little rivalries between students, and the mundane tasks like cleaning up the band room weren’t only present, they came across as interesting! It wasn’t until after the scene was done that I realized I had just enjoyed watching students tune band instruments! I thought this series was amazing and very, very accessible. Inami struggles to keep her fist under control whenever she sees a man — like Takanashi. And yes. That’s a katana on Todoroki’s hip. Capture from Crunchyroll’s stream of episode 1 of the first season. Souta Takanashi liked small, cute things. 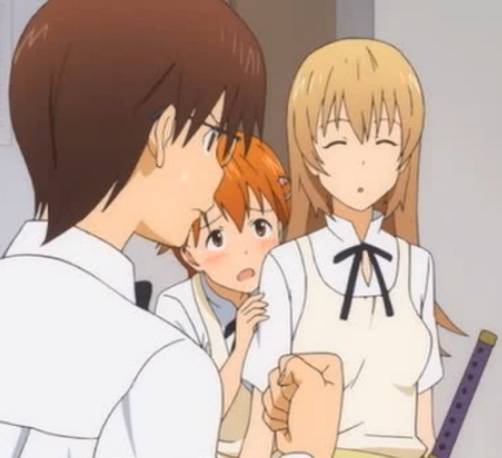 So when the petite and petty Popura Taneshima recruited him to work at the family restaurant Wagnaria, he accepted. While he was ready for the stress of learning a new job and getting to know his coworkers, he wasn’t ready for Mahiru Inami to punch him in the face the instant she saw him. That’s pretty much the first episode of Wagnaria season 1 (which you can buy from Amazon). The series follows the quirky characters and the situations they get into — and then makes those situations pivotal to the plot. Something funny like Inami’s instinct to punch on sight (well, it’s not funny for Taneshima) turned into a major arc for all three seasons. Inami and Takanashi aren’t the only characters with unusual traits. The manager, Kyouko Shirafuji loves parfaits and eats several a day — without gaining a pound. She also has a quasi-dark, gang-related past that she sometimes leverages to protect the restaurant. Yachiyo Todoroki, head of the wait staff, expresses her extreme devotion to Shirafuji by hand-making all of the parfaits. She also carries a katana — a real katana. Jun Satou is a chain-smoking cook who can’t bring himself to confess his feelings to Todoroki. Hiroomi Souma, also a cook, likes to dig up and use dirt he finds on the rest of the staff. He’s not evil, exactly, but he does find the whole situation endlessly entertaining. Those are just the routine characters. When Aoi Yamada shows up to work, she claims to be an orphan, and she constantly refers to herself in the third person. The store’s head manager, Hyougo Otoo, is rarely in the office because he’s looking for his directionally-challenged wife who went to the store for milk — years ago. And so it goes with Takanashi’s sisters, Shirafuji’s friends from school, and others who wander into the restaurant. Two things attracted me to this series: the characters who develop over time and the humorous situations. It’s a great starter series, and it’s also a lot of fun for anime veterans. 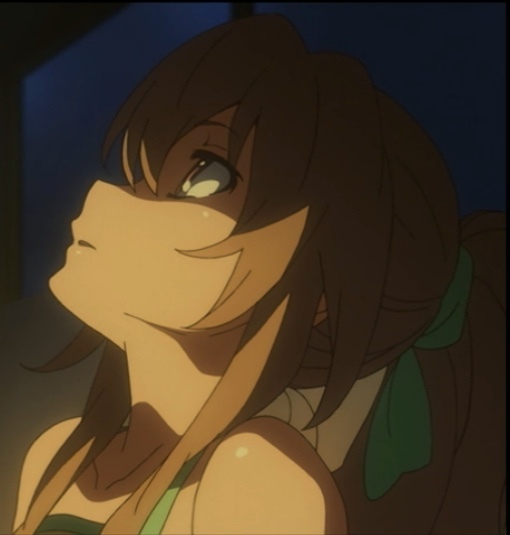 Inami, as a character, and her relationship with Takanashi are among my favorites in all of anime-dom. I also love the opening themes from all three seasons. Sakura figures out why Nozaki asked her to his place. Capture from the Crunchyroll stream for episode 1, season 1. The opening scene sets the tone for Monthly Girls’ Nozaki-kun, a.k.a. Gekkan Shoujo Nozaki-kun (available for purchase from Amazon). Chiyo Sakura psychs herself up to confess her love to Umetarou Nozaki. Unfortunately, her confession confuses him. He thinks he figures out what she wants. He thinks she’s a fan of his manga, which she didn’t even know he drew, and gives her an autograph. 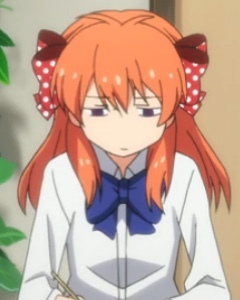 Will Nozaki ever understand and respond to her feelings? Will she ever be able to more clearly tell him? Watching their relationship develop is almost as much fun as watching the supporting characters and the situations they all get into. Mikoto Mikoshiba has a way with words that make the women around him feel appreciated and special, but he feels so thoroughly embarrassed at his own words that he withdraws quickly. Her voice so beautiful that it’s compared to a mythological siren, Yuzuki Seo is beautiful, strong, and confident — but lacks any semblance of social awareness, so she’s constantly offending — or injuring — people by accident. Yuu Kashima is tall and stately to the extent that she’s often asked to play the role of the prince in drama club. Many girls also fawn over her. Masayuki Hori, president of the drama club, can’t figure out how to relate to Kashima, so he frequently yells at her. It doesn’t help she often tries to skip rehearsal. I think my favorite supporting character is Ken Miyamae, Nozaki’s manga editor. He’s very much like editors I’ve worked with in the past in that he’s diligent and overworked. So, he’s frequently exasperated at Nozaki’s attitude. After all, Sakura’s not the only one he misunderstands all the time. After Nozaki isn’t able to answer Miyamae’s questions about the heroine’s motivations, the editor suggests Nozaki take some time to investigate a woman’s perspective. Nozaki cooks lunches for his friends and is amazed at how good he felt when they liked the food. Even with such strong and interesting supporting cast, Sakura and Nozaki remains the stars. Good clean humor and wacky situations make this a favorite. Aisaka wonders why she’s so calm with Takasu. Capture from the Crunchyroll stream for episode 9. Confession time. I usually prefer darker, grittier shows like Chrome Shelled Regios (which you can buy at a great price from Amazon). So, I almost feel embarrassed to say that I love ToraDora. It’s in my top 5 favorite anime series of all time. Ryuuji Takasu is a clean aficionado (okay, he’s a neat freak) who, because of his father’s genetic influence, always appears to be scowling and menacing. Fortunately, his best friend Yusaku Kitamura sticks up for him. Takasu is in love with Minori Kushieda, but he can’t bring himself to tell her. He literally runs into Taiga Aisaka, who, because of her hair-trigger temper and diminutive size, is known as the Palm Top Tiger (a nickname she hates). He discovers that not only is she in love with Kitamura, she’s best friends with Kushieda. They decide to help each other reach their romantic goals. Kitamura’s friend, the fashion model Ami Kawashima, complicates matters because of her feelings for Takasu and her dislike for, well, most everyone else except for Kitamura. It’d take more space than I want to take here to enumerate what I enjoy about this show. Takasu’s relationship with his mother, Yasuko Takasu, is bitter sweet. Takasu and Aisaka’s attempts to get closer to the objects of their affection is so earnest that it brings back awkward memories of high school romances (not mine, of course; my friends told me about their struggles*). Scenes like Takasu helping Aisaka with her swimsuit are so endearing and awkward that they, too, brings back adolescent memories (again, of my friends, of course!*). I think what I like the most about this series, and the reason I keep re-watching it, is how dedicated the friends are to each other. They work hard to support each other. Sometimes, they work too hard and push aside their own feelings, but they support each other through that. The character development, too, captivates my imagination. Watching Aisaka as she comes to understand herself; watching Kitamura as he tries to support his friends and manage his own feelings; watching Kawashima acknowledge who she is; these are the kinds of things that drew me to anime. You can buy the subbed version from Amazon; you can also buy the bilingual version for a steeper price (I think it’s totally worth it). 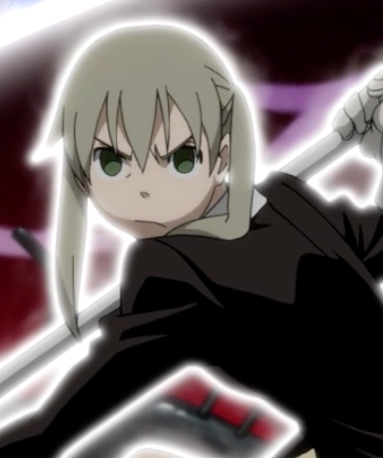 Maka confronting Asura. Watching her grow from an easy going student to a badass warrior was a great experience. Capture from the Funimation stream for episode 49. Soul Eater (available for streaming or purchase at the Funimation site; also available for purchase from Amazon) follows the students who attend the Death Weapon Meister Academy (DWMA) to learn how to defeat witches. Its head master is the Grim Reaper himself, Lord Death. Except he’s good and protects the world. The students are divided by their abilities. About half of them are Meisters, which means they train to wield weapons. The others are the weapons. Normally they appear human, but they turn into weapons for combat. Meisters and Weapons choose partners who they stay with through school. There are seven main characters. Maka Albarn and her weapon Soul Evans. They argue a lot but trust each other deeply. Death the Kid (Lord Death’s son) and his weapons Liz and Patty Thompson might be my favorites. He has an advanced case of OCD and the sisters are delinquents; together, they seem to heal each other. Black Star and his weapon Tsubaki Nakatsukasa were my least favorites at the beginning, but by the end, he so thoroughly destroyed the cliches that seemed to hold him back that I could only admire him. By the end of the series, they have to face one of the greatest evils the world’s ever known. There are so many reasons to recommend this series. The world is beautifully and stylistically drawn. It has a long fascinating history that has direct bearing on the drama. The characters are varied and deep; they have realistic motivations. The villains like Medusa Gorgon, Arachne Gorgon, and Asura are likewise varied and deep. They are also deadly and constitute real threats. The secondary character in this series are more vibrant and complex than the main characters is many other series. Maka’s dad Spirit Albarn, for example, is a flawed womanizer who nonetheless loves his daughter — and is a Death Scythe, one of Lord Death’s personal weapons and among the most powerful weapons in the world. Even characters that seem to be comic relief, like Excalibur, have roles to play. Action, great characters, strong themes, and powerful drama make this a great first series for anime holdouts. Yay for Nozaki-kun. To add to my previous comment on it, I also really enjoyed Sakura, she is cute and I loved her reactions towards her love interest. I had Hibike on my plan to watch for a long time now. All I can say is that the anime looks gorgeous in terms of art and animation. I only feel embarrassed in some circles. Within this community, though, I’m perfectly comfortable! I haven’t read any of the manga — how is it? Hibike’s animation is just beautiful. Kumiko is almost supernaturally adorable! Loved the soundtrack, too. My daughter is a band director, and she said that the concerts were pretty realistic, down to the finger positions on the instruments. I thought that was cool! Well actually same tho. Usually i would not mention in real life that its one of my fav anime. Nor would i talk a lot about anime in real life in general but it is getting better on this front. Watching anime with your own daughter sure sounds amazing. Sound! Euphonium was such a nice surprise. I want to see the sequels and movies. I’m a sucker for anime with unique concepts and as a musician I definitely appreciated that aspect with the storylines. You’re a musician? What instrument do you play? There was so much to enjoy about Sound! Euphonium. It didn’t hurt that when it came out, my daughter was going to college to be a music teacher. I play guitar, ukulele, and a bit of keyboards. That’s cool. I only saw the first season, but I want to see S!E2 and that Liz and the Blue Bird movie, too. She was going to be a music teacher? Nice!